It's back-with the same warm tone, unique circuitry, and vintage-style features and looks. 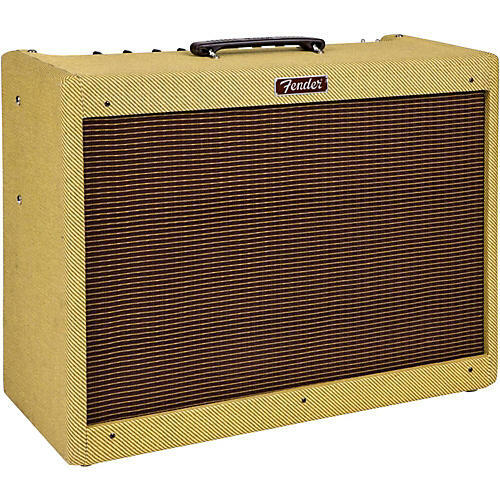 The Fender Blues Deluxe Reissue 40W 1x12" Combo Amp rocks - and not just for the blues! In 1993 Fender released the Blues series amps to great success and acclaim. These modern versions of vintage Fender amps from the '50s improved those designs with channel switching and reverb, while retaining the vintage style and tone. When the series was updated, the extremely popular Hot Rod series was born and became a new standard in tube amplification. Now Fender has brought back the Blues designs to satisfy the increasing number of enthusiasts who continue to request the warm tone, unique circuitry and vintage-style features and look of the original versions. The Blues Deluxe Reissue, a reinterpretation of the classic Deluxe amp with a tube complement of three 12AX7s and two 6L6s produces 40W of air-moving power through a 12" Eminence special-design speaker. It has Normal and Drive channels with independent Gain and Master for the Drive channel and a Bright switch for Normal channel. It also has an effects loop, reverb, presence, master volume, three-band EQ and Standby switch. Original Blues series styling includes a chrome control panel, vintage chicken head knobs, and, of course, genuine tweed covering. You loved the tone the first time around, and now you've got a second chance to pick one up. Order Now!